Cooking Time: 2 Hours 30 Mins. Score the fatty top side of the lamb about 1/4 inch deep. Season the lamb all over with salt and pepper. On a large rimmed baking sheet, toss the whole garlic cloves, onion, carrots, celery, potatoes, and mushrooms with a generous drizzle of olive oil. Place vegetables in an even layer and season with salt and pepper. 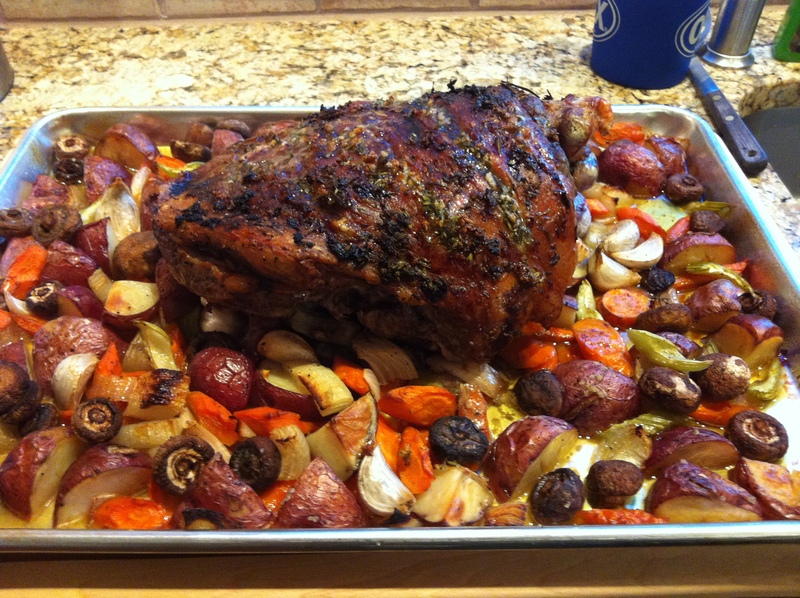 Scatter rosemary sprigs over the vegetables and set the leg of lamb on top, fatty side up. Spread half of the garlic-and-herb rub all over the lamb, making sure to rub it into the score marks. Roast the leg of lamb for 20 minutes. Spread the remaining rub over the lamb and add 1/4 cup of water to the baking sheet. Roast the lamb for about 1 hour and 20 minutes. Rotate the baking sheet a few times. Cook until an instant-read thermometer inserted in the thickest part of the meat registers 145° for medium. Add a few more tablespoons of water to the baking sheet at any point if the vegetables start to get quite dark.